VATICAN CITY (CNS) — The canonization of Blessed Junipero Serra will give the United States its first Hispanic saint, which should help more Americans realize that the country was settled by both Hispanics and Anglos, said the secretary of the Pontifical Commission for Latin America. Guzman Carriquiry, the Vatican official who hails from Uruguay, told reporters he hoped the canonization would promote greater acceptance of Hispanic Americans, recognition of the Catholic contribution to U.S. history and a more accurate understanding of how the United States became a country. 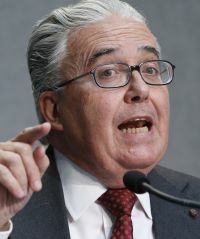 Jesuit Father Federico Lombardi, Vatican spokesman, announced April 20 that Pope Francis planned to canonize the 18th-century Spanish Franciscan missionary the evening of Sept. 23 during a Mass on the lawn of the Basilica of the National Shrine of the Immaculate Conception in Washington. The announcement, and Carriquiry’s comments, came during a Vatican news conference about Pope Francis’ visit to the Pontifical North America College, the U.S. seminary in Rome, May 2 to conclude a study day about Blessed Serra. An “Anglo-centric” reading of U.S. history, Carriquiry said, ignores the fact that Spaniards explored much of its eventual territory and made important contributions to the histories of California, New Mexico, Texas, Louisiana and Florida. Asked about the California Senate’s vote April 12 seeking to replace the statue of Blessed Serra in the U.S. Capitol with a statue of the astronaut Sally Ride, Carriquiry said, “what could this be saying? Bury in oblivion an ideal, the extraordinary Hispanic Catholic contribution a missionary made not only to the history of California but also of the United States? What could it mean in a state where many millions of Hispanics live and the great majority of them venerate Blessed Junipero Serra? They want to eliminate the only Hispanic — the only one — represented among the country’s notables” in the Capitol? Capuchin Father Vincenzo Criscuolo, an official in the Vatican Congregation for Saints’ Causes, told reporters the 1,200-page “positio” or position paper outlining why Blessed Serra should be canonized, relied particularly on 191 handwritten letters and reports by Father Serra about his life and his work in the California missions he founded. In contrast with charges that Blessed Serra mistreated native peoples, he said the letters prove that Father Serra was an “intrepid defender of the rights of native people,” a position that often put him at odds with local Spanish military officers and government leaders. Objections raised to the canonization, including some that are obviously “prejudicial, are completely contradicted by the documentation,” he said. Carriquiry said the real atrocities against the native peoples of California came long after Father Serra’s death with the 19th-century California gold rush and the push for California’s incorporation into the United States. Thousands died of disease or were forcibly removed to less fertile land elsewhere. Born on the Spanish island of Majorca in 1713, Father Serra went to Mexico in 1749 to work as a missionary. He began his ministry in what is now California in 1769, eventually establishing nine missions and evangelizing local Indians before his death in 1784. St. John Paul II beatified him in 1988. Pope Francis announced in January his decision to canonize the Franciscan. The official “positio” petitioning canonization had not been completed, Father Criscuolo said, nor had any work been done on verifying a miracle attributed to his intercession as a “blessed” — both of which normally are part of the sainthood process. While the cardinals and bishops who are members of the Congregation for Saints’ Causes will still vote on the cause, he said, the pope — who is the supreme legislator in the church — already has decided to proceed.